Objectives: It has been well documented that elevation of serum prolactin (PRL) level and weight gain are common in patients receiving treatment with atypical antipsychotics. The existing evidences show that serum PRL is elevated in schizophrenic patients treated with olanzapine. However, little is known about the long-term effects of olanzapine on PRL levels and weight gain in female patients with schizophrenia. Materials and methods: This study addressed this issue by investigating the relationship between serum PRL level and body mass index (BMI). Seventy-nine female patients with first-episode schizophrenia were recruited and received olanzapine monotherapy for 12 weeks. Serum PRL level and BMI were measured at baseline and at 4, 8, 12 weeks. Thirty-five age-matched healthy female individuals were recruited as controls. The severity of psychiatric symptoms was evaluated using the Positive and Negative Syndrome Scale. Results: The olanzapine treatment for 12 weeks significantly increased serum PRL (P<0.01) level and BMI (P<0.01). A positive correlation between the pre- and posttreatment changes in serum PRL level and BMI was observed (r=0.247, P=0.028). Conclusion: Our findings suggest that PRL might conceivably modulate weight gain in female patients with schizophrenia receiving olanzapine treatment; however, the exact mechanism remains unclear. A major adverse effect of antipsychotics on the endocrine system is hyperprolactinemia that causes sexual dysfunction and galactorrhea. Clinical observations have shown that olanzapine induces elevated PRL concentrations in a dose-dependent manner and has less effect on PRL levels than other SGAs such as risperidone.8–10 However, subsequent studies have not reached a consensus.11 One possible reason for this inconsistency is the neglect of gender differences in the research designs of related studies. There is evidence of gender-specific effects of olanzapine on PRL elevation in Japanese drug-naïve schizophrenia patients.12 As such, gender difference needs to be taken into consideration when evaluating the effect of olanzapine on PRL elevation.10 Although females are more prone to be affected by antipsychotic-induced hyperprolactinemia than males,13 there is little literature reporting the trajectory of olanzapine-induced PRL elevation in females and its relationship with body mass index (BMI). To address this issue, we carried out a 12-week longitudinal prospective study in female drug-naïve patients with first-episode schizophrenia under olanzapine monotherapy. All patients were Han Chinese and provided written informed consent before any study-related procedures were performed. All procedures were reviewed and approved by the Institution Review Board of Wenzhou Kangning Hospital. This study was performed in accordance with the guidelines laid out in the Declaration of Helsinki as revised in 1989. Ninety-one female first-episode drug-naïve (FEDN) inpatients were recruited at their initial evaluation for psychosis, shortly before antipsychotic treatment was started. The definition of the first episode was that patients had experienced their first-ever onset of psychotic symptoms. They were followed for about 12 weeks as inpatients after admission to establish a diagnosis of schizophrenia as per the Diagnostic and Statistical Manual of Mental Disorders, 4th edition (DSM-IV). Diagnostic assessments were completed by two independent senior psychiatrists for each patients and confirmed with the Structured Clinical Interview for DSM-IV (SCID). For all subjects, a questionnaire survey was conducted by trained research staff to collect general information, demographic characteristics, and physical illness histories. Complete medical histories, physical examinations, and laboratory tests were collected from medical records and collateral resources. Patients who completed 12 weeks of follow-up were included in the analysis. Finally, a total of 79 female FEDN patients completed 12 weeks of treatment. The average age and education level of these patients were 34.30±8.88 and 8.97±3.14 years, respectively. The clinical subtypes were: paranoid=38 (48.1%), disorganized=31 (39.2%), residual=4 (5.1%), and undifferentiated=6 (7.6%). A flow diagram of study screening, enrollment, and reasons for termination is shown in Figure 1. Figure 1 Subject flow through the study of olanzapine. From admission, all patients received three meals daily consisting of a balanced diet directly from the hospital and had the opportunity for one hour of physical exercise per day. All patients had similar food. During hospitalization, their family members or friends occasionally supplemented them with fruit or snacks. The patients in the present study could be considered a representative sample of institutionalized patients with schizophrenia in China. Thirty-five healthy Han Chinese control subjects were recruited from the local community in Wenzhou city. Their current mental health status and personal or family history of mental disorders were assessed by unstructured interviews. None of the healthy control subjects had a personal or family history of psychiatric disorder. Subjects with on-going allergies, infections, or a history of autoimmune disorders were excluded. Neither the schizophrenic patients nor the control subjects suffered from substance dependence or abuse other than of tobacco, received immunosuppressive drugs, or took medications for physical diseases. Furthermore, subjects who were pregnant or lactating were excluded. On the day when blood was sampled, the patient’s psychopathology was assessed with the Positive and Negative Syndrome Scale (PANSS) by one of the three psychiatrists. The psychiatrists had simultaneously attended a training session in the use of the PANSS before the study began. To ensure consistency and reliability of the PANSS ratings after training, the paired ratings of two psychiatrists for each patient assessment were compared at each of the repeated assessments during the study. In those comparisons, they maintained a correlation coefficient >0.8 on the PANSS total score. Height was measured at enrollment, and body weight and BMI (weight/height) were collected following an overnight fast at baseline, and at the end of 4, 8, and 12 weeks. The same scale and the same wall-mounted height measurement device were used for the entire study. Body weight was taken with subjects wearing light clothing and no shoes, and after having emptied their pockets. All measurements were repeated three times for each patient, and mean values were reported. Olanzapine treatment was initiated at 5 mg/day and increased to ~20 mg/day after 2 weeks according to clinical judgments. Low doses of benzodiazepines were used if necessary. The baseline BMI data were collected from the FEDN patients at the initial evaluation for psychosis, shortly before antipsychotic treatment was started. Serum samples were collected from all participants between 7:00 AM and 9:00 AM following an overnight fast. Samples were taken at baseline and 4, 8, and 12 weeks after beginning olanzapine treatment. The serum was separated, aliquoted, and stored at −80°C until they were assayed. Serum PRL was assayed using the standard of the Advia-Centaurs Chemiluminescence (Advia-Centaur CP, Siemens Healthcare Diagnostics, Germany) immunoassay method.14 Each assay was run in duplicates. All samples were measured by the same investigator who was blind to the study. The inter- and intraassay coefficients of variation were 9% and 7%, respectively. The normality of the data’s distribution was tested using Kolmogorov–Smirnov tests. All the demographic and clinical data, including BMI, were normally distributed (all P>0.05) in both patients and normal control subjects. Independent t-tests, ANOVAs, and chi-squared tests were carried out to compare the two groups in terms of basic sociodemographic and clinical characteristics. Data are presented as mean ± SD. Repeated measures multivariate analysis of covariance assessed changes in body weight, BMI, and serum PRL level between groups at 4, 8, and 12 weeks. Lastly, Pearson’s correlation coefficient was used to determine the association between serum PRL level change (pre- and posttreatment) and sociodemographic variables, especially PRL level change and BMI gain. Bonferroni corrections were applied to each test to adjust for multiple testing. All tests were two-tailed, with the significant level set at 0.05. Table 1 shows the subjects’ demographic data. There was no significant difference between the patients and the healthy control subjects in terms of age, education, height, and weight. There were significant differences in BMI (P=0.004) and serum prolactin level (P=0.001). Mean weight and BMI gain in patients since recruitment were 5.63±4.01 kg and 2.20±1.56 kg/m2, respectively. Notes: P subscore: positive symptom subscore; N subscore: negative symptom subscore; G subscore: general psychopathology subscore; N/A means not applicable. Abbreviations: BMI, body mass index; FEDN, first-episode drug-naïve; PANSS, Positive and Negative Syndrome Scale. The initial serum PRL level in patients with schizophrenia was 17.61±2.28 ng/mL, significantly higher than that in healthy controls (12.12±3.08 ng/mL; P<0.001; Table 1), and increased significantly to 67.70±47.45 ng/mL after treatment for 4 weeks, and to 84.14±47.70 ng/mL after treatment for 8 weeks. However, another 4 weeks’ treatment did not yield further increases in serum PRL level, although it remained significantly higher than at baseline (Table 2 and Figure 2). Notes: Prolactin are shown in ng/mL; weight are shown in kg; BMI, calculated as (weight in kg)/(height in m2). 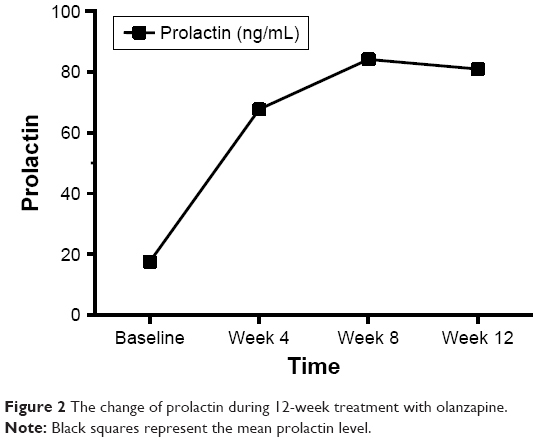 Figure 2 The change of prolactin during 12-week treatment with olanzapine. Note: Black squares represent the mean prolactin level. After 12 weeks of treatment, the average weight of patients increased to 55.37±7.20 kg, which was significantly higher than that at baseline (F=27.21, P<0.001), and the BMI was also significantly higher than that at baseline (F=25.07, P<0.001) (Table 2 and Figure 3). 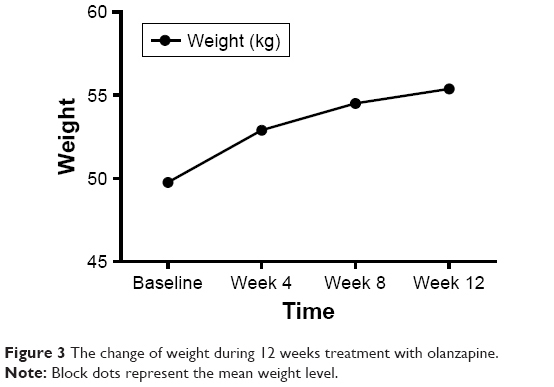 Figure 3 The change of weight during 12 weeks treatment with olanzapine. Note: Block dots represent the mean weight level. Regarding the correlation between serum PRL level change and sociodemographic variables, after Bonferroni correction for multiple testing, a significant positive relationship was found in BMI gain (r=0.247, P=0.028) and age (r=0.312, P=0.005). No relationship was noted between PRL change and education (Figure 4). 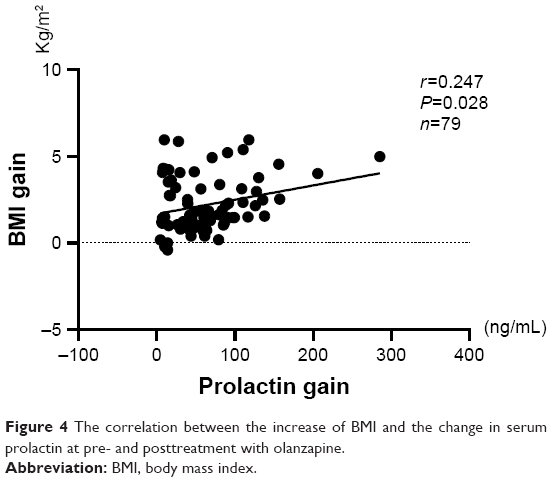 Figure 4 The correlation between the increase of BMI and the change in serum prolactin at pre- and posttreatment with olanzapine. Olanzapine is an SGA with an orexigenic effect that induces serious metabolic problems in humans.15 In this study, we observed that female patients with first-episode schizophrenia had significantly increased BMIs after 12 weeks of olanzapine monotherapy. This is consistent with most previous clinical and preclinical studies.16,17 In parallel with weight gain, the serum PRL levels in such patients also seemed to significantly increase. Early literature has documented that olanzapine elevates PRL levels11,18–20 in a dose-dependent manner.21 Further analysis have shown that there was a correlation between the increases in BMI and PRL level. It was reported that PRL may contribute to hyperphagia in females.22 Early preclinical studies showed that exogenous PRL administration leads to increased food intake and weight gain in female rats.23 Clinical observations also showed that hyperprolactinemia in humans may be associated with a high prevalence of obesity and that normalization of PRL levels could result in weight loss in 79% of prolactinomas patients.24,25 As such, our findings suggest that olanzapine-induced PRL elevation may conceivably modulate weight gain in females. Although most SGAs are associated with body weight gain, a meta-analysis indicated that olanzapine causes the highest weight gain in first-episode psychosis patients.26 However, olanzapine produces a modest increase of PRL compared with other SGAs such as paliperidone and risperidone.27 Therefore, PRL elevation may not fully explain the olanzapine-induced weight gain. Olanzapine is believed to work by its multiple-receptor-blocking profile. A recent study demonstrated that olanzapine causes weight gain by targeting serotonin receptor 2C (5-HT2C).28 As such, our findings imply that PRL elevation may be a component of weight gain in olanzapine-treated patients. However, it remains unknown whether PRL contributes more to weight gain with paliperidone treatment than with olanzapine. Further studies are required to investigate these relationships. Some other studies found higher BMI in FEDN schizophrenia patients (compared to age-matched controls) after the first weeks of treatment but found no significant difference before medication.34 The underlying mechanisms of weight gain are not completely understood. We speculate that several factors, such as differences in exercise load and intensity, nutrition intake, schizophrenia subtype, definitions of “drug-naïve,” or biological heterogeneity may be responsible for differences in baseline BMI and prolactin level. Perhaps the dysfunction of the PRL level is more sensitive or more vulnerable than that of weight gain in the early course of schizophrenia illness. However, this is only our speculation and we cannot offer reasonable mechanisms that explain why PRL was associated with BMI in our first-episode schizophrenia patients. Further research is necessary to clarify the relationship between PRL, BMI, and the onset of schizophrenia. The variability of prolactin and weight measurement was reduced in this study by processing all samples in a single batch. If different blood samples and subjects were assayed at different times or if significant random batch-to-batch variation were present, the reliability of the measurements would be somewhat lower than the values calculated here. By assaying all blood samples and subjects in the same batch, we avoided any systematic time trends in the assay results. This study has several limitations. First, the small sample size might increase the possibility of type II errors and make it difficult to generalize the findings. Moreover, it is unfortunate that the control cohort was much smaller than the patient cohort, as this may lead to bias in the statistical analysis. Second, this study employed female patients with first-episode schizophrenia and, thus, our conclusions may not be generalized to the whole schizophrenia population. Third, we did not measure the duration of the untreated first-episode patients with schizophrenia in this study. This could also contribute to the high BMI and prolactin levels observed before treatment. Fourth, we did not include male patients with schizophrenia as a comparison group, which we suggest is the primary limitation. Fifth, we could not measure estrogen levels and menstrual cycles, which might be considered a limitation. Sixth, we did not demonstrate the number of children and pregnancies in the present study. Seventh, the study would be more interesting if other atypical and classical antipsychotic medications were included. Such research ought to be performed in the future. We performed a prospective, open-label, 12-week observational study to investigate the effect of olanzapine monotherapy on female patients with first-episode schizophrenia. Our findings provided evidence that prolactin might conceivably modulate weight gain in schizophrenia patients receiving olanzapine treatment; however, the exact mechanism remains unclear. Further investigations and replications are needed to provide more robust conclusions in this field. The authors are grateful to all participants. This study was supported by the Wenzhou Science and Technology Commission Foundation (Y20140426) and (Y20160103). The funding sources of this study had no role in study design, data collection and analysis, decision to publish, or preparation of the article. FY drafted the manuscript, FY, LC, XF, KZ, CZhu, CX were responsible for clinical data collection and lab experiments. WT and CZha was responsible for study design and manuscript preparation. All authors contributed toward data analysis, drafting and critically revising the paper, gave final approval of the version to be published and agree to be accountable for all aspects of the work. Stroup TS, McEvoy JP, Swartz MS, et al. The National Institute of Mental Health Clinical Antipsychotic Trials of Intervention Effectiveness (CATIE) project: schizophrenia trial design and protocol development. Schizophr Bull. 2003;29(1):15–31. Buckley PF. Broad therapeutic uses of atypical antipsychotic medications. Biol Psychiatry. 2001;50(11):912–924. Song WS, Cha JH, Yoon SH, Cho YS, Park KY, Kim MH. The atypical antipsychotic olanzapine disturbs depotentiation by modulating mAChRs and impairs reversal learning. Neuropharmacology. 2017;114:1–11. Rummel-Kluge C, Komossa K, Schwarz S, et al. Head-to-head comparisons of metabolic side effects of second generation antipsychotics in the treatment of schizophrenia: a systematic review and meta-analysis. Schizophr Res. 2010;123(2–3):225–233. Kinon BJ, Kaiser CJ, Ahmed S, Rotelli MD, Kollack-Walker S. Association between early and rapid weight gain and change in weight over one year of olanzapine therapy in patients with schizophrenia and related disorders. J Clin Psychopharmacol. 2005;25(3):255–258. Evers SS, Calcagnoli F, van Dijk G, Scheurink AJ. Olanzapine causes hypothermia, inactivity, a deranged feeding pattern and weight gain in female Wistar rats. Pharmacol Biochem Behav. 2010;97(1):163–169. Evers SS, Boersma GJ, Tamashiro KL, Scheurink AJ, van Dijk G. Roman high and low avoidance rats differ in their response to chronic olanzapine treatment at the level of body weight regulation, glucose homeostasis, and cortico-mesolimbic gene expression. J Psychopharmacol. 2017;31(11):1437–1452. Madhusoodanan S, Parida S, Jimenez C. Hyperprolactinemia associated with psychotropics – a review. Hum Psychopharmacol. 2010;25(4):281–297. Fraguas D, Correll CU, Merchán-Naranjo J, et al. Efficacy and safety of second-generation antipsychotics in children and adolescents with psychotic and bipolar spectrum disorders: comprehensive review of prospective head-to-head and placebo-controlled comparisons. Eur Neuropsychopharmacol. 2011;21(8):621–645. Suzuki Y, Fukui N, Watanabe J, et al. Gender differences in the relationship between the risperidone metabolism and the plasma prolactin levels in psychiatric patients. Prog Neuropsychopharmacol Biol Psychiatry. 2010;34(7):1266–1268. Suzuki Y, Sugai T, Fukui N, et al. Differences in plasma prolactin levels in patients with schizophrenia treated on monotherapy with five second-generation antipsychotics. Schizophr Res. 2013;145(1–3):116–119. Sawamura K, Suzuki Y, Fukui N, Sugai T, Someya T. Gender differences in prolactin elevation induced by olanzapine in Japanese drug-naïve schizophrenic patients. Prog Neuropsychopharmacol Biol Psychiatry. 2006;30(8):1511–1514. Smith S, Wheeler MJ, Murray R, O’Keane V. The effects of antipsychotic-induced hyperprolactinaemia on the hypothalamic-pituitary-gonadal axis. J Clin Psychopharmacol. 2002;22(2):109–114. Margari L, Matera E, Petruzzelli MG, et al. Prolactin variations during risperidone therapy in a sample of drug-naive children and adolescents. Int Clin Psychopharmacol. 2015;30(2):103–108. Skrede S, González-García I, Martins L, et al. Lack of ovarian secretions reverts the anabolic action of olanzapine in female rats. Int J Neuropsychopharmacol. 2017;20(12):1005–1012. Zhu Y, Krause M, Huhn M, et al. Antipsychotic drugs for the acute treatment of patients with a first episode of schizophrenia: a systematic review with pairwise and network meta-analyses. Lancet Psychiatry. 2017;4(9):694–705. Dayabandara M, Hanwella R, Ratnatunga S, Seneviratne S, Suraweera C, de Silva VA. Antipsychotic-associated weight gain: management strategies and impact on treatment adherence. Neuropsychiatr Dis Treat. 2017;13:2231–2241. Song X, Fan X, Zhang J, et al. Prolactin serum levels correlate with inflammatory status in drug-naïve first-episode schizophrenia. World J Biol Psychiatry. 2014;15(7):546–552. Druyts E, Eapen S, Wu P, Thorlund K. The risk of elevated prolactin levels in pediatric patients exposed to antipsychotics for the treatment of schizophrenia and schizophrenia spectrum disorders: protocol for a systematic review and meta-analysis. Syst Rev. 2014;3:116. Petrikis P, Tigas S, Tzallas AT, Archimandriti DT, Skapinakis P, Mavreas V. Prolactin levels in drug-naïve patients with schizophrenia and other psychotic disorders. Int J Psychiatry Clin Pract. 2016;20(3):165–169. Suzuki Y, Ono S, Sugai T, et al. Dose-dependent effects of olanzapine on QT intervals and plasma prolactin levels in Japanese patients with stable schizophrenia. Hum Psychopharmacol. 2011;26(6):440–443. Noel MB, Woodside B. Effects of systemic and central prolactin injections on food intake, weight gain, and estrous cyclicity in female rats. Physiol Behav. 1993;54(1):151–154. Gerardo-Gettens T, Moore BJ, Stern JS, Horwitz BA. Prolactin stimulates food intake in a dose-dependent manner. Am J Physiol. 1989;256(1 Pt 2):R276–R280. Greenman Y, Tordjman K, Stern N. Increased body weight associated with prolactin secreting pituitary adenomas: weight loss with normalization of prolactin levels. Clin Endocrinol. 1998;48(5):547–553. Nunes MC, Sobrinho LG, Calhaz-Jorge C, Santos MA, Mauricio JC, Sousa MF. Psychosomatic factors in patients with hyperprolactinemia and/or galactorrhea. Obstet Gynecol. 1980;55(5):591–595. Tek C, Kucukgoncu S, Guloksuz S, Woods SW, Srihari VH, Annamalai A. Antipsychotic-induced weight gain in first-episode psychosis patients: a meta-analysis of differential effects of antipsychotic medications. Early Interv Psychiatry. 2016;10(3):193–202. Leucht S, Cipriani A, Spineli L, et al. Comparative efficacy and tolerability of 15 antipsychotic drugs in schizophrenia: a multiple-treatments meta-analysis. Lancet. 2013;382(9896):951–962. Lord CC, Wyler SC, Wan R, et al. The atypical antipsychotic olanzapine causes weight gain by targeting serotonin receptor 2C. J Clin Invest. 2017;127(9):3402–3406. Albayrak Y, Beyazyüz M, Beyazyüz E, Kuloğlu M. Increased serum prolactin levels in drug-naive first-episode male patients with schizophrenia. Nord J Psychiatry. 2014;68(5):341–346. Shrivastava A, Johnston M, Bureau Y, Shah N. Baseline serum prolactin in drug-naïve, first-episode schizophrenia and outcome at five years: Is it a predictive factor? Innovat Clin Neurosci. 2012;9(4):17–21. Aston J, Rechsteiner E, Bull N, Borgwardt S, Gschwandtner U, Riecher-Rössler A. Hyperprolactinaemia in early psychosis-not only due to antipsychotics. Prog Neuropsychopharmacol Biol Psychiatry. 2010;34(7):1342–1344. Shrivastava A, Tamhane M. Serum prolactin level and severity of psychopathology in patients of schizophrenia. Indian J Psychiatry. 2000;42(1):48–51. Roelfsema F, Pijl H, Keenan DM, Veldhuis JD. Prolactin secretion in healthy adults is determined by gender, age and body mass index. PLoS One. 2012;7(2):e31305. Huang M, Yu L, Pan F, et al. A randomized, 13-week study assessing the efficacy and metabolic effects of paliperidone palmitate injection and olanzapine in first-episode schizophrenia patients. Prog Neuropsychopharmacol Biol Psychiatry. 2018;81:122–130.